So now, in an interesting game of Presidential Succession Leapfrog, the guy who is sixth in line is at the head of the class. The Secretary of the Treasury is about to run everything in the economy outside of the Department of Agriculture (or perhaps this week we'll collectivize the farms as well). Aside: This was supposed to be a humor piece, but can I stop to ask whether it's just me or is that picture scary, I mean in a "They're wearing Totalitarianism in Washington this season" kind of way? I used to see Secretary Paulson in pictures and feel soothed. Now I'm not. But maybe that's because he's about to have more financial power than anyone who has ever lived. Anyway, in addition to that worry is another, which is that we may be starting a third family dynasty. 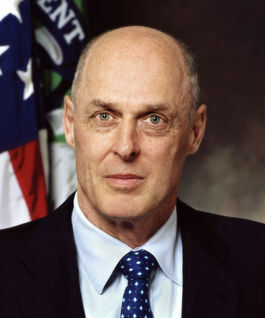 Bush, Clinton and now Paulson. Henry's brother Pat ran for President many times, usually coming in a close 93rd, but haven't we had enough of the family thing in government for at least a few generations? Oh, you say that they're not brothers, they spell their last name differently. Well, first of all, that's part of the conspiracy. And second, that's just like you educated elites to try to ram down the throats of us regular folk things like spelling and deduction, and reason and science. The good news is that we no longer have to worry about who we choose in the upcoming election. Both candidates may keep Paulson on the job. Four More Years. Four More Years. Where have you gone, Paul H. O'Neill?